I always love it when John gives me the opportunity to help tell you the story of a fellow gear jammer. When I was a kid, truckers were considered knights of the road, something I would like to see us get back to. 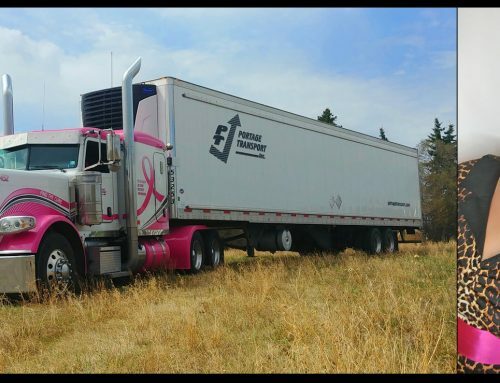 Our rig of the month driver would like to see that too and is proof positive that there are still young guys out there that really get it. Luke Phillips is a throwback and a very humble guy who didn’t think he really had any magazine worthy stories… well, that was the only thing this young man said to me that was wrong! After having a lengthy BS session, definitely not a formal interview, I can honestly say I have renewed hope that we can attract some great young people into trucking. Having known Luke mainly from his exploits I was surprised by his age, you will be too. Luke Phillips was born in Burnaby, BC and is almost sure he was brought home from the hospital in the cab of a truck. His dad Tim ran for NIC back then from Vancouver to Edmonton and that is where Luke spent his early years, riding along with his mom and dad in that old Western Star. I’m sure he would have been fine continuing his education from the front seat of the Star but his parents decided he should go to school so they moved up to Stony Plain around the time he was 4. His dad Tim continued to stay on with NIC for about a year before moving on to local work so he could be home with the family more. Fast forward to when he was close to being 18 and Luke picked up a job at the airport, which he was not fond of. He had to shovel snow, sweep up cigarette butts, pick garbage – you know, all the glamorous stuff! But it wasn’t the hard work he didn’t like, it was the type of work. Luke said to me he has always known he was going to be in trucking and that’s what he was working towards even at the airport. He saved the money he earned there and took his courses so he could go out and get his class 1 on his 18th birthday. His father Tim had been working for John Whissell at Whissell Rock Products moving crushers and equipment around. John decided that, unlike most other companies, he would give an 18-year-old the chance to drive. There was a well worn T800 KW that nobody wanted to drive, almost nobody… Luke thought he’d died and gone to heaven to get that truck. He got set up hauling tridem end dump moving gravel in and around the Edmonton area. Many days he’d be back at the shop first and his dad would pull up with the super b gravel trailers. Tim would stop at the gate, jump out and say, “I’ve parked enough of these you back it in.” Young Luke would jump at the challenge! Of course, a tight yard and inexperience would have him somewhat cross up. When the next train driver came in, he too would pull the button and head back for a smoke. At least once all the drivers were there sitting on lawn chairs smoking and hollering advice as one by one Luke worked on parking all of their b-trains! While some would be upset or just give up on the racket, Luke just takes it all in stride. Having those guys watch him and critique his budding skills only helped to make him a better driver because he knows that the only way to learn is through doing and listening. I’m sure that’s what had John move him straight up to pulling super-b in just a matter of weeks. One day after getting his truck put away Luke’s dad pulled up with the 40 wheeler. “Do you wanna come with me to move a hoe?” Tim asked. His son naturally jumped at the chance to check out something new so Tim slid over to the pass side and Luke pulled his first set of wheels. They were headed out west near Seba Beach to move a 365 and the truck was pretty light for the job. Tim’s way of teaching was and is still the best, rather than telling his kid what to do he would watch and ask questions at the appropriate time. Allowing him to learn and make mistakes but making sure he wouldn’t make any that were costly. It was raining pretty hard that day and there was a long hill up from the river valley to climb with a 90-degree corner at the bottom. Luke thought for a quick minute and said: “No I think we’ll get a tow.” That was the right decision with a little Pete with Super 40’s pulling that kind of weight. Apparently, Tim thought so too because he gave Luke the phone and when it rang he was now the ‘guy’. Of course, he could and still would call his dad to ask questions but for all intents and purposes at 18 he was responsible for moving all the gear. He told me the boss, John, only found out when they ran into each other on-site at the pit one day. Luke stayed on working for John until he got the bug to go bigger. The next logical step in heavy haul would be to move rear steers and platforms. He had a connection in Kenny Lowe at Entrec and got hired on to be a push truck driver. For the those of you who don’t know, heavy haul is almost like an apprenticeship (it actually should be one) you start with learning how to put trailers together and running the push truck, then you graduate to driving the pull truck with a mentor and finally you drive the truck and run the show. Like at Whissell Luke relished the chances he got to just move the trailers and back them up in the yard. He also pays keen attention to what the old hands have to say. “You know when truckers are sitting around the coffee shop or lunch room and they use the condiments to tell the story?” he said. I knew exactly what he meant and I also wonder how many other young guys pay attention to the knowledge available in these BS sessions. While most stories get a little better with time Luke is right if you listen in there’s most likely some info that will help you when you’re in a tough spot. That said I don’t know if there is much of anything that would have prepared you to deal with what happened to him while pushing one mod up highway 36. Thankfully no one was coming when the Mod steered its way into the opposing ditch. Luke had a birds-eye view as the many half-inch chains snapped and it tipped over off the platform. While he walked away unscathed one can only imagine the rodeo ride he went on! Again most people probably would’ve packed it in after something like that but Luke took it as a learning experience. The Mod was hauled off to be reconstructed and he continued on the path to becoming a pull truck driver albeit with a huge appreciation for making sure of the integrity of the hitch. 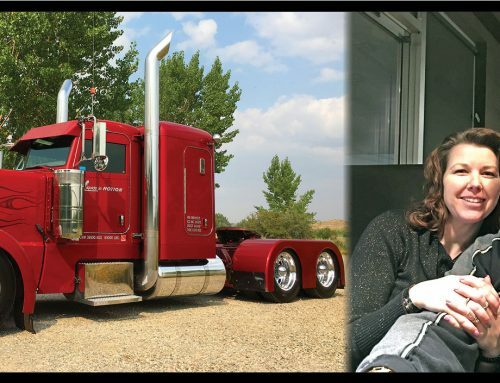 It was only a few months later Luke got his shot to be a pull truck operator again hauling a Mod of about 300,000lbs up highway 36 and on up 881 to a site near Fort Mac. Of the half dozen or so men facing the test, Luke was the only one to make it on his own. After setting the mod in place on site his mentor Kenny Lowe let him know it was the same one he had followed into the ditch months before! After it was rebuilt it was dumb luck but he got the chance to make sure it arrived this time. After a period of time at Entrec, Luke was given a golden opportunity by his old boss John. He was given a blank check and a clean slate to build the heavy haul truck of his dreams. John had a job to do hauling old draglines and heavy equipment to be scrapped. Most of it was inoperable so it would have to be winched and dragged on and off the trailer. It was also heavy, heavy iron and in inhospitable places. So with the help of KW and Lennox Welding, Miss April was born. 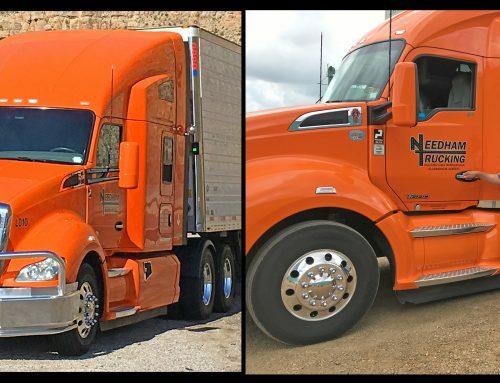 If you have driven highway 63 or 881 you’ve seen her, a bright orange tri-drive W900B. Luke loved that truck and working for John Whissell. John was content letting him go out and get it done and was never concerned about his age. Unfortunately, that work started to dry up and he was forced to make a change to keep busy so Luke went to IRT leaving Miss April behind. John knew they had a connection though so when the time came he was going to send her to auction he called Luke and asked if he would get her cleaned up and drive her to RB. It just so happened that he was coming down from Ft. Mac with a broken tri-drive for IRT right then… so a call was made to his boss. If you’re a truck nerd like me you know how some of them are like the one that got away well Luke was lucky enough to get this one back. 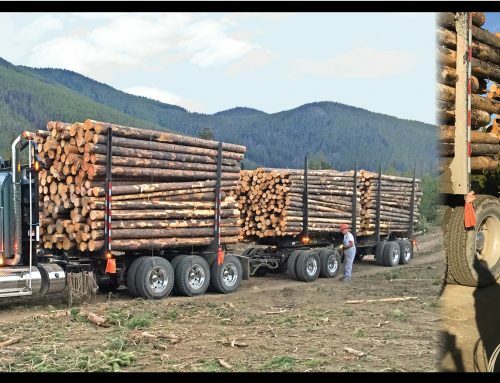 While there Luke and Miss April hauled all kinds of interesting loads most of the time on 48 or 72 wheels from shovels, to haul trucks, and even a vintage locomotive. I mention the number of wheels often because it takes a lot of poise and patience to haul that kinda weight. It’s the kind of poise that we often believe only comes with age. As we were chatting Luke recounted a toboggan ride on Beacon Hill at 24 wide on 72 wheels with a push truck! Well as he tells it you just remain calm and talk the push trucker through it and maybe you come down the hill a little hotter than you wanted to. Most people would expect a 23-year-old to hit the panic button when that happens and that’s the problem. Age and time are not the only ingredients that equal a safe trucker. Luke equates his success to hard work and his best friend; his father Tim. They talk at least an hour a day and he’s always been able to call at any hour for a little timely advice. In fact, Tim is in Luke’s phone as “ the guy with the knowledge”. His dad has always given him the freedom to figure things out but was there to offer that wisdom when things were a little sideways. Luke says he’s grateful for the times where things have gone wrong because it’s an opportunity to learn. It’s something that’s uncommon in the industry now and that needs to change. You can learn how to drive a truck from a book but you don’t really learn to drive until you are out there. As we talked that was what became more and more apparent. Young guys like Luke are out there, they may even be reading this, and we need to help them. We need more people like John Whissell to take the chance on a young guy or like Kenny Lowe. More of us in the industry need to offer ourselves up to help advise those kids that don’t have a great dad like Tim. If you are a young guy you need to take the time to learn in the city and in the yards. Spend some serious time in reverse and in the coffee shops really listening to us “old” hands you might just learn something. For that matter we all need to spend more time listening to one and other, trucking doesn’t have to be solitary, it should be a brotherhood. Now for those of you wondering why there’s a Pete on the cover when I told the story of the lovely Miss April, I wasn’t gonna leave you hanging. Actually, I should probably explain that Miss April got her name from being a calendar truck, yup you guessed the month of April! Luke had a great offer to go drive for Ascent Transport so he once again had to leave Miss April behind but I don’t think the void is quite as big this time. The truck you see on the cover is “White Trash Beautiful” or WTB for short. WTB is a 2014 389 with heavy specs and when I asked about engine specs I was simply told it pulls like a freight train. So if you get passed in a white and orange flash by a train-load of mats while pulling your tridem… it might just be Luke. Hit him up on Instagram @lukedirtphillips and maybe he’ll give you the lowdown on the name. If nothing else you’ll see some great truck pics! While doing all his heavy hauling he met Jessica Liske and the two are engaged to be married. They live on 5 acres out in the Alberta beach area together. With the job at Ascent, she doesn’t have to lead him around in the pilot truck and she can come along sometimes. Sounds reminiscent of another couple some 20 odd years earlier, doesn’t it? Although I have never met Tim I would say Luke is a chip off the old block. Nothing he says is boastful, he’s humble to a fault and really wants to just get the message out there that this can be a great industry to work in. 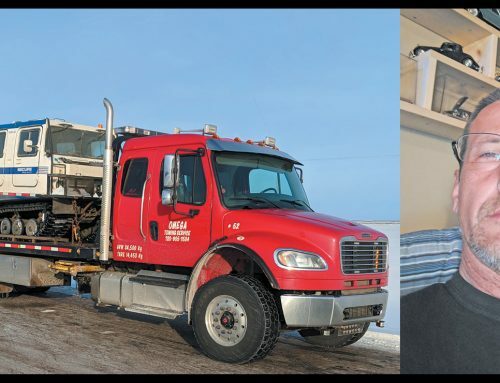 From hauling equipment into Rogers Place to unloading huge haul trucks up north, at 23 years old Luke has done a lot of interesting things in this industry. I echo his sentiment that we are fortunate to have mentors like Tim and John to bring these young guys along in the industry.